Insurance has become something of a necessary evil in recent years. There are a lot of people that begrudge paying out for the various insurance that we're told we need. But, you have to stop seeing things that way and look at insurance for what it really is. Something to fall back on when the unexpected arises. And believe me, life has a way of throwing something your way when you least expect it. Prevention, as they say, is better than cure. You should stop seeing insurance as something that you grudgingly pay out each month. See it as a lifeline should you be stung by something unexpected. You're not alone in all of this. Everybody needs insurance for a whole host of different reasons. It's not just about covering you in the event of an accident, either. It's about protecting your assets and earning power in the event that you are set back unexpectedly. One way or another, everybody needs insurance. There are dozens of different policies to choose from. That can be difficult to wade through. Consequently, you may not know exactly what you need to sign up for personally. This guide is intended to point you in the right direction so that you aren't paying for something you don't need. And, likewise, to ensure you aren't missing out on protection that could be vital for you. Let's take a look at a couple of the most common insurance options, and why you might need it. Not many people like to think about what will happen after they pass away. It's pretty morbid, isn't it? But, the truth is, you never know what's around the corner. No matter how old you are, you should always have a contingency plan in place. Life insurance was initially a means to protect the assets of wealthy families in the event of a sudden death. Now, though, it's much more common place. As if death wasn't traumatic enough already. Many families find themselves stung with unfair financial obligations in the wake of loss. This can include things like the pursuit of debt, funeral costs, and losing assets. Life insurance is the only way to make sure that your family is fully provided for if you happened to pass away. Everyone is rightly concerned about how their families would cope without them around. Life insurance is how to make sure are well looked after when you're not around anymore. Car insurance is non-negotiable in just about every developed country in the world. While the details may vary from provider to provider, they all set out to achieve the same thing. To protect you (and your family) in the case of accidents on the road. It may be a case that you've been injured in a collision, or your car has been damaged beyond repair. In both those instances, someone is going to have to foot the bill. And you probably don't have that kind of money lying around at all times, do you? That's why car insurance is so imperative. You'll need to be fully covered if you're going to seek compensation. And, similarly, you'll also need your insurance provider to pay for a new car. 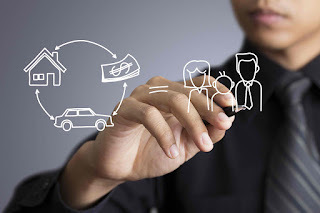 The way auto insurance works is by paying a monthly fee that amasses to your name. That is where your provider will pull the money from should you need the financial assistance. You might think that it would make more sense just to save the money yourself, but car insurance is legally required in most countries. For homeowners, their house is their most valuable asset. There likely isn't going to be another purchase you will make in life that even remotely compares to your home. That's why it's fundamentally important that you protect the value of your home at all costs. Typically, home insurance will cover you in the event of theft or accidental damage. This can include things like fires or flooding. However, there are certain loopholes. If the damage is a direct result of your own negligence, you'll likely not be covered. It's crucial that you always read the small print when applying for home insurance. The terms of the contract will vary from provider to provider. You may miss some key information that will mean you're not covered in certain eventualities. It's always better to be safe than sorry. If you don't feel like the coverage is right for you, don't hesitate to look around at what else is on offer. Different companies will also specialise in different areas. Getting a quote from a company like Direct Axis, for example, could turn up completely different results than another insurer. This, admittedly, is not required in every country. There are many different states that offer free healthcare, but not everyone can be so lucky. In those other countries, health insurance is what covers your medical expenses. And you can't put a price on good health, can you? You need to make sure that you can afford to pay for any surgeries or prescriptions that may be required unexpectedly. Without proper coverage, an accident or illness could see you slip into a lifetime of debt. You could instantly undo all your life's hard work in a single moment through no fault of your own. Don't let that happen to you. Make sure that your healthcare provider is acceptant of your health insurance. As with every other type of insurance, there are exceptions to the rule. Many families suffer through treatments only to find that their insurance doesn't cover it, so make sure you get to grips with your coverage. If you can afford to pay premiums on these four types of insurance, you stand in good stead. Some of them are legally required, but others are optional. Either way, though, you should always aim to be covered by all four of them. There are certainly other kinds of insurance available, but they will be dependent on your specific needs. Good job Kenneth! In my opinion travel insurance and mortgage insurance are also essential insurance plans that everybody needs. What you think about these two?